I am so excited that the Shea Moisture line is finally available in Canada in a few different outlets. I was introduced to this line by a friend that frequently traveled to the US to visit her mother and heard about this line in a lot of natural hair care forums. Shea Moisture is a hair and skin care line that is reasonably priced and incorporates the use of Shea butter in nearly all of their products. I have used shampoo, conditioners and styling products from this line and they are jam packed with quality. There are so many benefits of Shea butter and various uses for it that has many cosmetic and beauty brands incorporating Shea into various products. Shea butter is a fat that is extracted out of nuts from the African Shea tree and is said to come packed with so many benefits for the skin and hair. Some of the benefits include: moisturizing the skin, nourishing hair, preventing stretch marks, promoting growth in the hair, and treating Eczema, Acne, and Psoriasis. I was glad to finally get my hands on this Shea butter and soap because the wintery months have caused havoc on my skin and it is in real need of TLC. 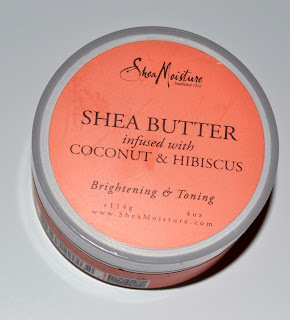 Shea Butter infused with coconut and hibiscus is a moisturizing product that is said to aid with dry skin, chapped lips, burns, haircare, cracked and dry heels or elbows , etc. The smell on this is absolutely beautiful and sweet without being overbearing. Generally I hated the nutty smell of Shea and steered away from it, but because this is infused with coconut and hibiscus it masks the scent. The texture is hard as most Shea butters are but once you take some out, it melts on contact with body heat. I really like this because it is not greasy, yet leaves your body feeling really soft and glowey. I like that this product because it can be used in several ways and the price is extremely reasonable. I purchased it for $7.99 CAD and feel even though it is a small jar it will last for a very long time. Along side the Shea butter I also purchased the organic argan oil and raw Shea butter soap. This soap is fantastic as well, and pairing both the soap up along side the Shea butter helps improve the skin by miles. This soap leaves the skin feeling smooth and moisturized and clean. The smell is sweet without being overbearing as well and the ingredient list is superb. Comes packed with Shea butter, coconut oil, apricot oil, honey, and my favourite argan oil. I definitely recommend this soap if you are looking for something new that will help your skin retain moisture and provide an overall glow overtime. I purchased this soap on sale for $6.99 CAD and am seeing many improvements in the overall appearance and texture of my skin within the last couple of weeks.